Over the years I have witnessed lots of fur kids cross Rainbow Bridge. Many of them were my own and several others were clients. Although it is a tough and emotional event for anyone to go through, I consider it an honor to be asked to accompany anyone who wants me to be present when the final goodbyes are said. However today was a bit different. Today I stood next to my parents as my dad said goodbye to his 20 year old cat Missy. 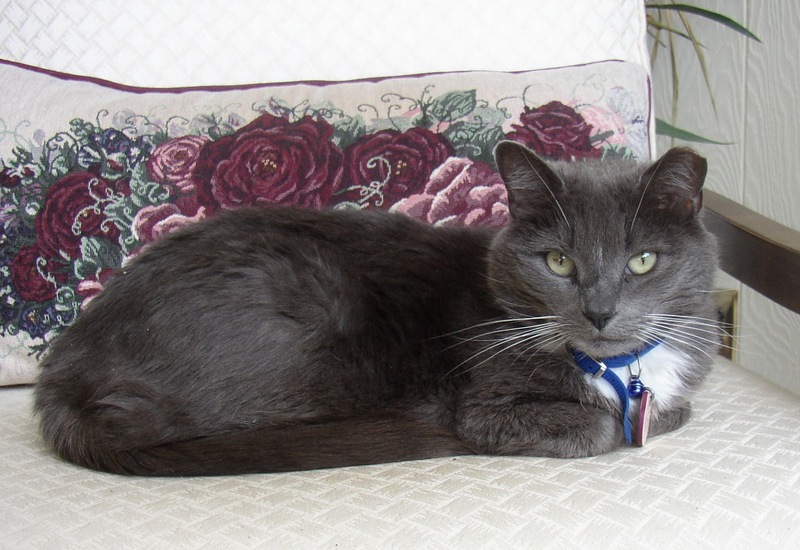 Missy was a wonderful spirit….extremely grateful for her life and the love she received. She especially loved to lie on the newspaper as Dad read it, and despite the fact that she was not transparent, he managed to just read around her. She also loved to clean out his yogurt containers and be given bites of ham or turkey. She seemed to have a special detector that just sensed when someone was going to make a sandwich. As soon as the meat drawer opened she would show up from nowhere and meow loudly (yell was more like it) until she got her taste. Dad has seen a lot of animals come and go out of our family over the years but the connection that he and Missy had was uniquely their own. So special was their connection that he was the only family member important enough that she would eagerly wake from her napping to greet him when she heard his voice as he walked in the door. Today was bittersweet for me because the tables were turned. Instead of my parents standing with me as I said goodbye to a fur kid, I stood with them as they said goodbye. Both of my parents have always understood the importance of animals in my life and have been very supportive of my career choice but I particularly owe a special thank you to Dad and I’m not sure I’ve said thank you for this one. Let’s just say he’s owed a big thank you for tolerating the times that he wasn’t always given advance notice of new furry family members. I can’t count how many times he would walk in the door from work to find a new furry face and wonder where that one came from! And Missy was one of those many stories. She was a rescue like most every other pet we ever had. Dad actually knew we were bringing her home after a horse show but she was so feral when we got her that she hid in my sister’s room for the first several weeks she lived with us. At some point the relationship between he and Missy became apparent to all of us – Missy decided she was Dad’s kitty and Dad decided that was fine with him! She slowly developed her courage and by the end of her 20 years she was a very wise little southern lady who knew what to do to get what she wanted…just nap until Dad got home and then show up and turn on her southern charm!